classified by degrees: acute, sub-acute and chronic. 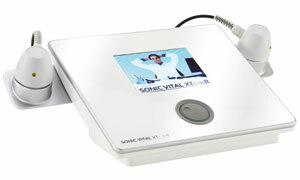 Convenient dual-frequency treatment heads (1 & 3 MHz) with 2 different sizes (1 & 4 cm²) to be connected simultaneously. No need to unplug and plug the different heads: 2 connectors for a user-friendly appliance. Integration of the power supply in the case to avoid sensitive transformers to lay around. Made in Germany: developed and manufactured in Germany. Therapy duration 0 - 59 min.